Heading west out of Albuquerque on Route 66, travelers can enjoy a scenic descent from Nine Mile Hill into the Rio Puerco Valley, where a Parker through truss bridge crosses the steeply eroded banks of the Rio Puerco River. The valley is the site of Laguna Pueblo, the home of Puebloans since the 1300s. Because the Rio Puerco is known for its violent flooding and severe erosion, the State Highway Department specifically chose a Parker through truss bridge design for the Rio Puerco Bridge to eliminate the need for a center pier and prevent washouts. The Federal Government funded the bridge in 1933 as part of President Roosevelt’s effort to use emergency monies for highway construction. Completed within a year, the bridge opened the Laguna Cutoff to transcontinental traffic. In 1937, the alignment officially became U.S. Route 66.The Kansas City Structural Steel Company conceived the structure, and F.D. Shufflebarger was in charge of constructing the bridge. The Rio Puerco Bridge has a 250 foot long span and is one of the longest single span steel truss bridges built in New Mexico. The bridge consists of 10 panels measuring 25 feet in length, each with its top cord at a different angle, as is characteristic of Parker truss design bridges. The 25-foot wide deck is concrete with an asphalt surface and rests on steel stringers. This design was selected partially because it was commonly used during the late-1920s and 30s, but also because it was particularly suitable for this bridge, which needed to withstand a river capable of massive flooding that had washed away previous bridges along the Rio Puerco. In 1957, the truss was remodeled, and the lower portal struts were removed and replaced by lighter struts that were inserted above to create a higher clearance. Metal guardrails were added to protect the truss members. This bridge served motorists on Route 66 for many years, and when I-40 was completed, the Rio Puerco Bridge became part of a frontage road across the Rio Puerco. The structure was listed in the National Register of Historic Places in 1997. 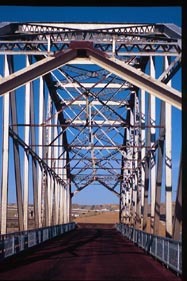 In 1999, the New Mexico State Highway and Transportation Department replaced it but preserved the historic bridge. Though currently closed to car traffic, the old bridge is open for people to walk across, allowing visitors a glimpse of the old Highway 66 slowly curving and dipping as it disappears into the vast New Mexico desert. The Rio Puerco Bridge is located off of and parallel to Interstate 40 at exit 140 west of Albuquerque, NM. A post-1937 alignment of Route 66, now used as a frontage road, is east of the bridge and reconnects with the interstate at exit 149. Visitors can walk across the bridge.